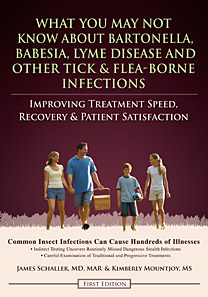 Babesia and Bartonella Book — Free! James Schaller, MD offers 800 pages of solid diagnosis and treatment information. Do you want advanced, current, up-to-date information on Bartonella, Babesia and Lyme disease? A Print edition is available for purchase at Amazon.com. Order Here. Acrobat Reader required to view this E-Book. You can download the latest version for free. Download Here. Do you want to avoid costly mistakes made by both traditional and progressive practitioners? Do you want to start on the right foot at the beginning of your diagnosis and care? Do you want to prevent errors in your treatment? Dr. Schaller handles many "treatment failure" patients, so consider reading this book to prevent needing him in the future. This book contains information covering many areas of medicine. It offers tools for diagnosis, so that your illnesses will not be missed for 1-40 years. It also shows thoughtful, precise treatment care, and how errors in your treatment can cost you a fortune and are not effective. Many over rated treatments are not fully effective in removing all tick and flea-borne infections, and can result in disability, unemployment, divorce, addictions and even possible death. Discover common errors made by talented healers, so you will not remain ill long-term. This book can allow you or your ill loved ones to get on with life—now. 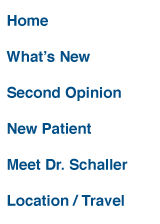 Dr. James Schaller is rated a best doctor by both physicians and patients. His national and international medical practice involves treating people of all ages for whom routine care has failed. He is a full-time reader and researcher, who works part-time treating those who failed treatments of highly gifted and smart healers of every school and type. This is Dr. Schaller's eighth book on tick infections. He has three books on Babesia, another book on the top malaria treatment in the world--sweet wormwood (Artemesia) derivatives, the only recent modern diagnostic and treatment text on Bartonella (color) and the only modern and advanced diagnostic checklist textbook for Bartonella, Babesia and Lyme disease. In this latter book he shows how to prevent the error of missing a positive infected patient. He has also published a 330 page text of selected basic references for researchers and academicians to help them start the long process of solid competence with the super specialization of emerging tick and flea-borne infections. Treating tick and flea-borne infection medicine is not as easy as treating a strep throat, especially if you have gone untreated for many years or even decades. JAMES SCHALLER—A SUPERIOR MD PER PHYSICIAN PEERS AND PATIENTS WHO LIVES TO MAKE THE HOPELESS—RECOVER A JOYFUL LIFE! This book is copyrighted. It may be posted only with the material that is posted around it. This book is not free to sites posting destructive and negative toned materials. Give Dr. Schaller a Chance at Making Your Hopelessness be transformed into a Joyful Life! Print Edition available at Amazon.com. Order Here.